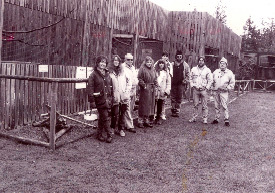 In the early nineties, GROWLS (Gabriola Rescue of Wildlife Society) came into existence. Like many endeavors, it began as a good idea percolated between two friends – in this case, Michelle McMillan and Darlene Mace. Both local animal lovers, the women saw a need in their community for a service that provided care for injured or orphaned wildlife, along with immediate and accessible assistance for people encountering the animals. Michelle wanted to “officially” house and rehabilitate wildlife on her property as they were gravitating there anyway through word of mouth of her care and dedication. Darlene saw the long term value in the idea but, as she was busy raising her two young children, considered her role as temporary, just long enough to help her friend get the service up and running. The first few years were tentative, with more setbacks than successes. It is one thing to love wildlife, but another to navigate bureaucracy, to fund raise, budget, and plan meetings, to keep volunteers enthused and committed, to maintain the focus of the GROWLS mandate, and to not burn out during the busy months of spring and summer when human and wildlife movement are at their most active! Although a permanent facility has not yet materialized on Gabriola for GROWLS, it still remains on the group’s wish list. When Michelle, for personal reasons, left the island, GROWLS would surely have gone the way of the dodo if not for Liz Ciocea. After years of working for the BC Ambulance Service rescuing the human population on the island, Growls was a natural fit for Liz's skills with both people and wildlife. The main groundwork had been done but it was hard to keep a core group functioning without at least a couple of fully committed volunteers. Darlene and Liz both felt there was too much invested in the group already and too many continuing pressures on the island wildlife and its habitat to let GROWLS dissolve. For a number of years GROWLS hobbled along as lamely as many of the animals it set out to help. Then a lucky break came in 2002, when GROWLS came to the attention of Billie Hatton. She had invaluable skills as a treasurer and meticulous record keeper, She was also key in maintaining the Registered-Charity status that has helped considerably with fund-raising efforts and donations. This allowed Liz and Darlene to better concentrate on animal rescues. Like the Treasurer, every volunteer has brought something valuable to the group – be it in the form of doing actual rescues and driving, or by donating a specific skill. People like Betty Lou Hagen, who although physically unable to do rescues, has contributed steadily over the years with her wildlife watercolor greeting cards, all add up to making GROWLS the vital organization it is today. Many individuals over the years have made their own unique contributions to GROWLS and for reasons as varied as themselves have moved on to other interests and places. A couple of dedicated (stubborn??) ones have stayed on. Others continue to demonstrate their support the best way they know how: be it the artist donating his work, the businesswoman with her annual United Way Company donation earmarked for Growls, or the neighborhood children running a lemonade stand. All have helped give GROWLS, “the organization,” a boost to continue on its path. Unfortunately, the unpredictable and time-consuming nature of wildlife rescue usually leaves the society continually looking for more experienced or willing rescuers. As GROWLS has grown, it has established rewarding relationships with others who were - and some who still are - committed to the well being of wildlife and animals in the region. Dr. Hans Flatla was the first local veterinarian to offer support, and that relationship has been continued by Gabriola’s present vets: Dr. Patricia Leather and Dr. Thomas Ulhig. Dr. Ken Langelier in Nanaimo has worked for decades gathering data from eagle necropsies that helped ban the use of lead shot by duck hunters and provide valuable resources for local raptors. Lynn Woods’ absence is sorely missed in the Nanaimo area for her small bird center, "Blue Roofs" (a beautiful sight was Lynn putting a few baby birds in her ample bosom to keep warm as they made there way to more “traditional” rehabilitation facilities). GROWLS has watched Robin and Sylvia Campbell’s North Island Wildlife Recovery Association in Errington grow steadily from a small collection of outbuildings to an expansive, high-tech educational facility that hosts thousands of visitors every year. Now, in 2008, GROWLS has reached a new phase of growth. Darlene is still working "temporarily" at keeping it going strong. Its members have a greater awareness of the need to extend their network to other organizations with similar challenges in ensuring the survival of local wildlife. With a new pager in place, a larger core of committed volunteers, and some beneficial grants that have allowed for signs, training courses, and a new website, GROWLS has an increased capacity for effecting positive change for wildlife and habitat protection. The residents of Gabriola Island have many challenges ahead, but GROWLS is now in a better position than ever to face the development of the future. 1995 Growls field trip to Errington.